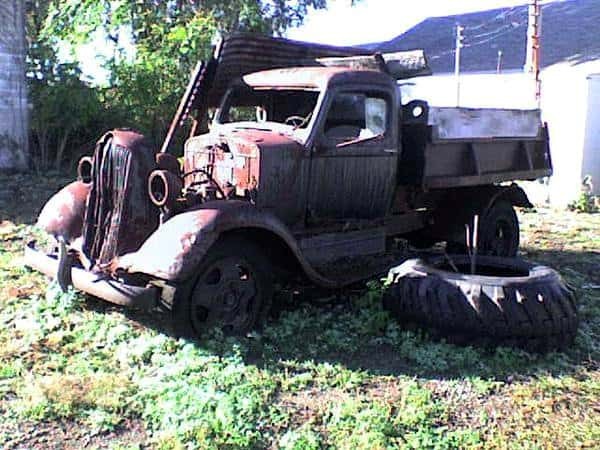 In 2007 I worked at a dealership in the local town that had a 1936 Dodge dump truck sitting in a grass lot behind a building. I’d have to trim weeds around it when the dealership got slow. 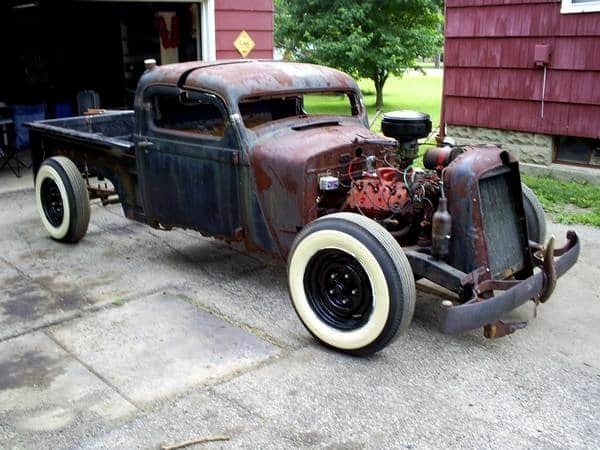 I’ve always bought rat rod magazines and always thought about building one, but just never found a body that wasn’t outrageous in price. So one day I asked the owner of the dealership if he’d ever sell that ole’ dump truck out back. He said “for you, $600”. I said “consider it sold” and I saved the money and I bought it. A year went by and I started a new job at the local junk yard. There I bought every possible part off of all sorts of vehicles to help with building my truck. 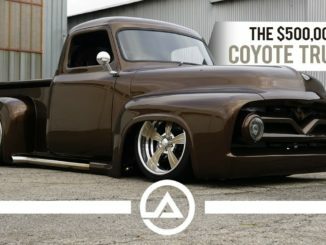 I’ve always built 4×4’s and low riders while growing up, but this truck was on a whole new level of mind-creating for me! 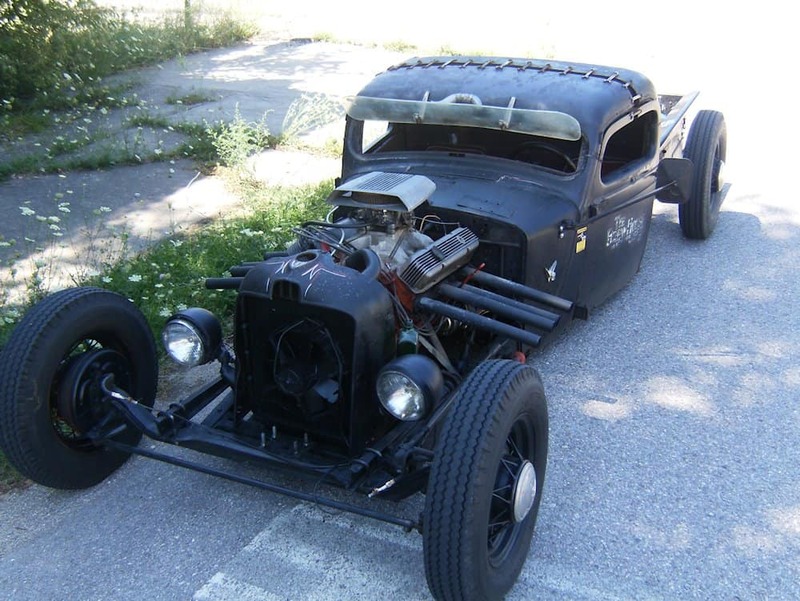 I used a 1950 Ford truck frame and flathead engine, a Ford 9″ rear end and a 3 speed manual transmission. Later on I changed the flathead over to a 383 Dodge engine with a 727 transmission craving more power! Not having the metal fabricating machines and tools or money, I chopped the top anyway. To fill in the gaps on the roof and doors after the chop, I used old wrenches my grandfather passed down to me. They are probably the most “eye catching” item that everybody notices at first glance. Then they see my “Amish Air Ride” – I am able to raise or lower the rear about 4″ with the turn of a crank. I was tired of being limited on where to drive and now I can go just about anywhere. Everybody that see’s my creation just scratches their head’s. Air Ride was just too modern for my Rat Rod, so I had to improvise! In 2011 I changed the engine to a 413 Dodge engine I had bought at the junk yard out of an RV. I bought a duel tunnel ram intake for the 413 and slapped it all in the rat rod and had in running within 6 hours. That motor started out okay, but it never ran right and there was a ticking noise from the beginning. Driving it to a local show that motor threw a rod bearing. So I went back to the old faithful 383. It’s faster than that 413 and looks just as nice! I love driving my rat rod to all the local shows. 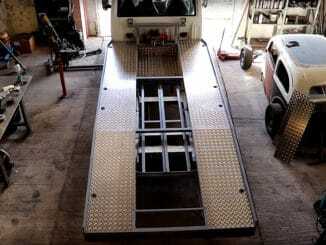 This truck was built completely by me with a little help from my local neighbors, friends, and family. All the parts – every piece, came from Wabash County, Indiana. 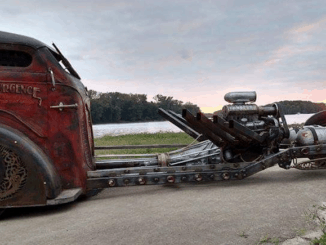 So far I don’t think that I’ve spent over $1,500 in the purchasing and building of my Dodge rat rod.